Academy Hills Park re-opens with new jogging path, benches, landscaping and irrigation system. 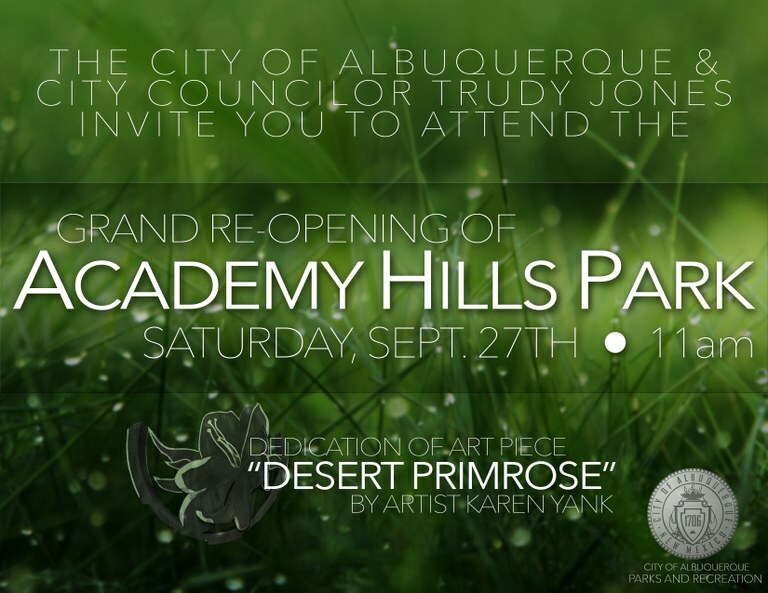 Councilor Jones is pleased to announce that Academy Hills Park will officially re-open on Friday September 12, 2014! "I am so proud of the improvements the Parks Department made to the Academy Hills Park. They have made an already valuable asset invaluable to our community" said Councilor Jones. 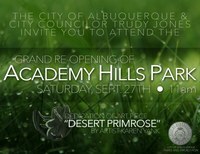 "I hope everyone can join us at the Grand Reopening and Art Dedication on Saturday September 27 at 11:00am." 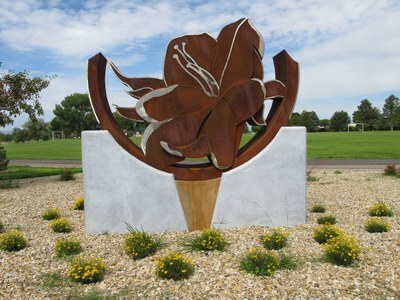 A new public art piece called "Desert Primrose" by Karen Yank. a shorter, natural surface path will parallel it at the upper end of the park. 2 additional picnic tables with benches & 11 additional benches. 5 of these benches are ‘Tribute Benches’ that have been sponsored by the public and the neighborhood. 27 new trash cans & 6 new ‘mutt mitt’ dispensers. New plantings that include 69 new trees and 213 shrubs. Adjustments, upgrades, repairs and additions to the irrigation system were done to both help prevent water waste and allow us to irrigate properly when and where water is needed. We will be able to accurately track water use and eliminate the water runoff that plagued the old system. The slope across the concrete drainage will be heavily planted with drought resistant trees and the turf there will be over seeded with native grasses which require much less water than traditional park turf grass.